Manufacturer & Exporter of Kashmiri Kesar. 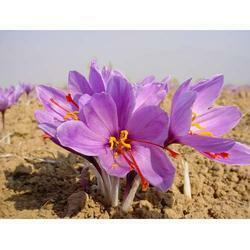 Our product range also comprises of Kashmiri Saffron and Iranian Saffron. We are considered in the market to be one of the leading processors and providers of this impeccable range of Kashmiri Kesar. For reasons of providing maximum satisfaction to our clients, it is processed through a number of quality examinations. In addition, the offered range is known to be marked at the most reasonable rate possible making it highly asked for.